Our group of radiopharmaceutical and organic chemistry deals with interdisciplinary research and development of novel compounds and materials with a potential to be applied mainly in medicine and industry. We also deal with the preparation of radionuclides and study their properties and their peaceful use. New paper on “In Situ In Vivo radiolabeling of polymer-coated hydroxyapatite nanoparticles to track their biodistribution in mice” is out! We are participating the TAT11 symposium. 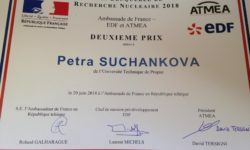 Congratulations to a 2nd place in the competition for the Becquerel prize award! 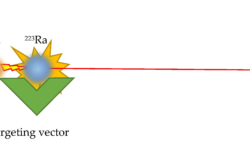 New review article “Progress in Targeted Alpha-Particle Therapy. What We Learned about Recoils Release from In Vivo Generators” published in Molecules journal. Papers trilogy on quantitative biokinetics of titanium dioxide nanoparticles just published online! New article in the Journal of Nanoparticle Research! New publication – book chapter entitled “7-Beryllium-Recoil-Labelling of Nanoparticles” by Uwe Holzwarth, Neil Gibson, Matteo Dalmiglio and Jan Kozempel just appeared in a book “Isotopes in Nanoparticles Fundamentals and Applications” published by Pan Stanford Publishing Pte. Ltd. More information on publisher website here. Agency for Health Research of the Czech Republic awarded! On 23rd Feb. 2016 the Agency for Health Research of the Czech Republic published the results of one-stage public competition for years 2016 – 2019. In total 628 projects were submitted. The Ministry of Health of the Czech Republic finalised the list of the projects recommended for financial support awards together with budget allocation of 289.4 million CZK for 2016, that allowed to support 139 projects (22,13 % of total received proposals). Total costs for the awarded project proposals is 1,400. million CZK. Project proposal by IMC AS CR (Mgr. 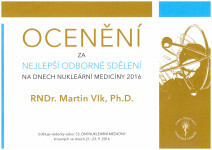 Martin Hrubý, Ph.D.), LF UPOL (PharmDr. Miloš Petřík, Ph.D.) and FJFI ČVUT (RNDr. Ján Kozempel, Ph.D.) grant No. : 16-30544A “New multistage nanodiagnostics for cancer imaging and prediction of antiangiogenic therapy efficacy” with a total budget of 15,136,000.- CZK was evaluated and took 14th place in panel 3 – tumorous diseases (in total 129 project proposals were funded). On 27th of January 2016 the Industrial property officee of the Čzech Republic issued the patent No. : 305667 “Method of chromatographic separation of radionuclide mixture, chromatographic paper, process for its preparation and kit for radionuclide mixture separation” authored by J. Kozempel, M. Vlk, P. Mičolová a A. Bajzíková. Disclosed is a method of chromatographic separation of radionuclide mixture, wherein the separation is carried out on a chromatographic paper with an in advance impregnated non-polar extraction agent N,N,N´,N´-tetrahydrocarbyl diglycolyl amide with an aqueous solution of a mineral acid as a mobile base. Further, the invention provides a chromatographic paper impregnated with N,N,N´,N´-tetrahydrocarbyl diglycolyl amide, process for its preparation, and a kit for the separation of a radionuclide mixture containing the paper and a mineral acid aqueous solution.